Web 2.0 is a concept popularised by Tim O'Reilly to describe the various changes occurring on the internet like greater interactivity on websites. Although a number of criticisms have been leveled against it, the term has become a useful reference word when discussing the internet and the changes indicated by the term 'Web 2.0' will continue to occur. In the business world, with Web 2.0 comes the concept of 'The Long Tail' and the 'Freemium' business model. According to Yochai Benkler in 'Wealth of Networks', the changes created by Web 2.0 are far-reaching affecting the very roots of our economy and culture. In the future, we can expect many improvements to the internet making it easier and more exciting to use. The term Web 2.0 was popularised by Tim O'Reilly of O'Reilly Media while organising a conference about the changes occurring on the internet. Since then of course, the term has become synonymous with any interesting new changes or trends occurring on the internet and websites. What are some examples of Web 2.0? What are some criticisms of Web 2.0? How should Vodafone be responding and reacting to Web 2.0? How is Web 2.0 and the internet affecting society, culture, business and the world? What lies beyond Web 2.0? Here's a part 1 and part 2 of a 15 minute Spotlight episode on Web 2.0 to give you a good idea on what Web 2.0 is before you take a look at the report. After coming up with the term, Tim O'Reilly wrote an article on Web 2.0 and published it on his site to fully better explain what he actually meant by Web 2.0. The article is titled What is Web 2.0?. As this is the 'defining document' of Web 2.0, it is best to briefly cover the main content of the article. I've summarised the main points and examples of his article below. In the same way that programs like Microsoft Office are run on Windows, the Web is the platform or operating system upon which programs and services are written for and delivered on. Netscape believed they would dominate the desktop via their browser and would sell servers to companies to run their internet applications. Unfortunately, they lost to Microsoft's Internet Explorer which was bundled with every computer. Google however, treated the internet as a platform and delivered their services over the internet straight from your browser. Google is now dominating the internet over Microsoft. DoubleClick requires sales agreements and deals with corporations and businesses on a formal basis. Google's Adsense is an automated service that anybody can sign up too and implement. With Adsense, both large corporations and a single blogger can earn revenue via Adsense easily. DoubleClick has now been bought by Google. Google understood the internet as a ad-delivery platform better than DoubleClick. 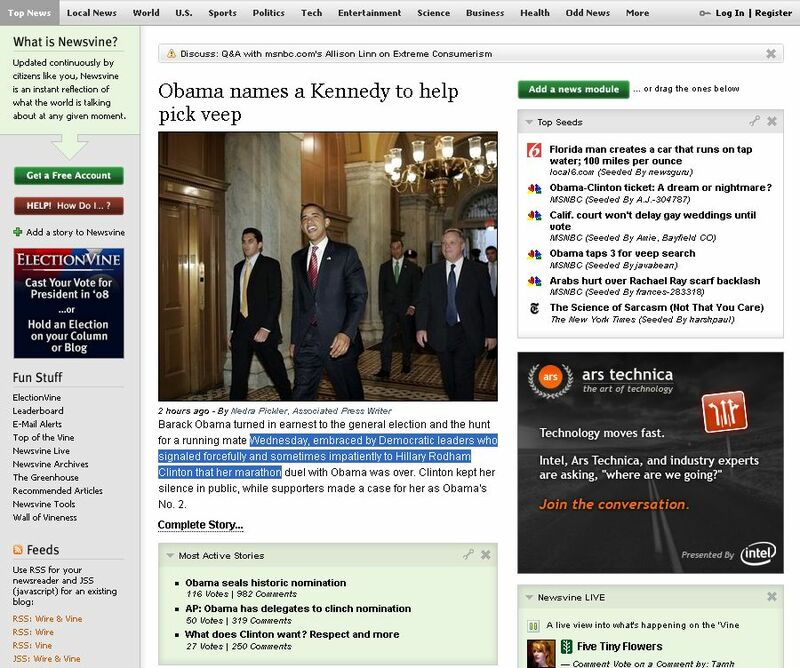 Akamai serves businesses by hosting customers' multimedia on their servers to handle 'overflow' from clients' websites. BitTorrent technology however has its users upload as they download so you don't need to purchase extra servers. In all these examples, the victorious company understood the concept of 'internet as a platform' better and was able to exploit the internet more efficiently than the more traditional-minded company. The users of the internet contribute to the internet as well. Wikipedia, Blogger and Creative Commons all showcase the 'wisdom of the crowds'. Users aren't just consumers on the internet but they also make significant contributions on the internet as well. 'Intel Inside' was the advertisement for computers powered by Intel chips. But it wasn't really the Intel chips that made computers better, but what could be achieved with the Intel chips that really mattered. Similarly, data is merely the core of a website, it is the interactivity and data management that really matters. NavTeq owns the data but both Mapquest and Google Maps have different ways of displaying and handling the data. Google Maps is now preferred over Mapquest. The web is dynamic and the 'software' must be continually updated. You can't spend 6 months in development. You have to evolve and develop because the internet is updated every second. Users are also co-developers. The search engine and the program working in the background is continually being updated by the Google team. O'Reilly tries to point out that it is because Google Maps was both simple and easy to 'remix' by hackers onto their websites that it gained popularity. O'Reilly argues in fact that we should be designing internet applications with precisely that 'remixability' in mind so as to make them more popular and easier to adopt. Taggylicio.us is a mash-up website that searches tags on various websites like Youtube and Flickr. Searching on 'robots' will yield a page like this. The internet is cross-platform. You can have Windows, Linux or a mobile phone but all can use the internet. It is no longer tied down to a single operating system. Twitter allows you to update your profile via mobile or PC. This refers not only to multimedia such as streaming video and more, but features that make life easier for you. Widget box provides web widgets that you can embed on your webpage to increase the functionality of your site. I strongly recommend reading the article, it is brief but provides some good ideas and concepts. Over the years the ideas and concepts on what Web 2.0 is have evolved. Your data can be easily transferred and exported to a different website. Information and advertisements you see is getting more and more relevant to you. Greater efficiency in information filtering and handling. Users are driving the behaviour of what websites and technologies are emerging. Services and applications can now be embedded on other websites. Internet widgets are now becoming very popular. 'You' was voted as the person of Year in 2006 emphasising that the interactive web is here to stay. Web 2.0 allows the sharing of media at an unprecedented rate and has challenged the traditional notions of copyright. The internet has given rise to the Creative Commons Copyright which is replacing the traditional 'all rights reserved' copyright. There is no single definition. The very fact that a single undisputed Web 2.0 definition is hard to reach, reflects the nature of the internet where everyone has a voice. Intro to Web 2.0 - A Squidoo Lens with links to Web 2.0 reports and websites. Web 2.0 conference - A list of presentations covered in the Web 2.0 Expo 2007. SeoMoz's 2007 Web 2.0 awards cover a wide range of Web 2.0 websites. I have picked a number of examples in an attempt to showcase the concepts of Web 2.0. Keep in mind the concepts of Web 2.0 as you explore these sites. Do check out the full list of websites when you have the time. Swicki is a customised search engine you create for your own website by putting in what websites and keywords are relevant. Also shows a data cloud for recent and popular searches. Where you can search for information about The Simpsons. Click below to try searching. Ning is a website where you can create your own private social network. It's very useful for clubs and small societies. Here's a quick review on Ning. 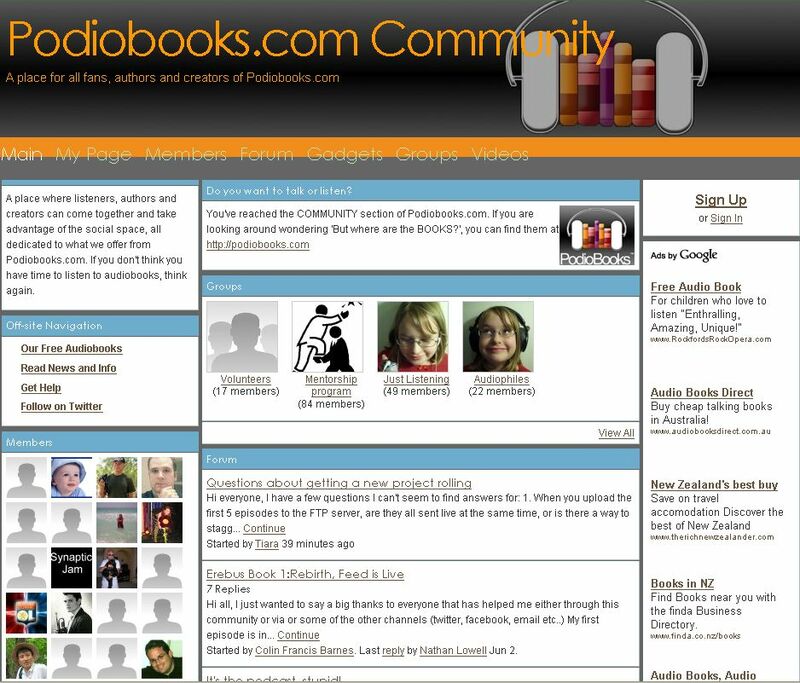 Podiobooks where you can network with other audio book lovers. Newsvines is a social news website where users can submit articles from around the web and vote on them. All users also have their own 'column' where they can write and contribute articles. A very popular column of Newsvine on technology. Some of the entries are 'clipped' from other websites while others are written by the columnist Andrew. Microsoft's World Wide Telescope is an application that allows users to browse the night sky and zoom into various stars and other features. Users can save 'sky tours' to replay them later. The application also has social networking utilities allowing users to share tours with other users and add comments. The 7.5 minute video below describes what the program does. Take note of the emphasis placed on the story-telling aspects. Imagine if the concepts of World Wide Telescope were applied to historical data? What would it be like if there was a World War II History Telescope where you could create your own online stories, documentaries and narratives to share with others? As with any idea or word, there have been a number of criticisms of it. Below are some of the more common criticisms of the word 'Web 2.0' and some responses. It's just a buzzword - As Tim Bray mentions in his article Not 2.0, whilst 'Web 2.0' was invented as a marketing tool for an internet conference, it has become a useful reference word. We are definitely seeing new emerging patterns and trends and people understand what you mean by 'Web 2.0'. No real technological innovation - Somewhat true. What we are talking about here is better adoption and engagement by businesses and people of existing technology. Many websites forget the basics - This is more of a pitfall than outright discarding of Web 2.0. It's not Web 2.0. It's Internet Bubble 2.0 - There is truth in this. But without entrepreneurs, investment, risk and competition how can there be advancements? Privacy Concerns - These are correct. However, many services have privacy controls giving you the ability to control your information and many governments are passing laws to improve this. None of these criticisms really attack the changes that are occurring nor will it stop the changes from happening. It is semantics and debate over the definitions. There are noticeable technological and cultural changes occurring on the internet and websites. People can now access much more information than before and are demanding more control over what information they can receive. What does it mean for businesses? With the creation of the internet, two concepts have become prominent. The economic concept of 'The Long Tail' by Chris Anderson and the 'Freemium' business concept by Fred Wilson. Previously products and business were limited physically. For example, you could only print so many words on a newspaper. Audiences are similarly limited. Only people within a certain area can visit your store to buy something. Most people aren't going to drive a hundred kilometers just to buy something from your store. This means that to profit, companies must stock items in store that appeal to most people. Traditional, music and media companies followed the 80-20 rule or Pareto's principle in order to stay alive. 80% of your profit come from 20% of your customers. 80% of your profit comes from 20% of your music stock. Since only 20% of your merchandise will be profitable, you should focus on stocking and manufacturing 'music hits' to remain in business. Note: This 80-20 is a rule of thumb. The 'clumping effect' where most profit comes from a small number of customers does occur but the ratios differ depending on the situation and industry. The head of the tails represents the 'hits'. Most people will buy hits while only a few people will buy the alternatives. The long end of the tail is the less popular merchandise that only a small amount of people will buy. Chris Anderson argues that things have changed with internet stores like Amazon or iTunes. Previously expenses were relatively high. These expenses were the result of physical limitations of having a physical store. It didn't make good business sense to display or stock items that weren't in high demand in your store. Why stock something that only a few customers will purchase when you can stock more of what you know will sell? However, online websites or online stores can contain a library of infinite titles. The cost of adding one extra mp3 song or stocking one extra book in the warehouse is next to nothing compared to actually displaying something on the shelf. This means that aside from selling 'hits' you can also 'stock' and sell the alternatives. Now you can cater to suit everybody's taste and still maintain profit. As Anderson notes, a large significant percentage of store sales are actually alternatives. One thing to note is that everybody has different tastes. Most consumers don't just want the 'hits', they also want other less popular products as well. Everyone's taste varies. It's just that in a world where shelf space was limited, their local retailer wouldn't have stocked alternatives as it wouldn't have been profitable. But now it's possible to provide those 'non-hit' alternatives and still make a profit since the cost of providing the non-hit is now much cheaper. What was once unprofitable is now made profitable. This is the 'long tail' that Anderson speaks of. The long tail is made up of the alternatives that were once unprofitable which are now where most of the potential sales and profits lie. Everyone sells hits, so consumers are now looking for whoever can provide the hits and the alternatives. Whoever can provide more variety than the competitor will dominate. Chris Anderson says there are three rules to doing business in such an environment. 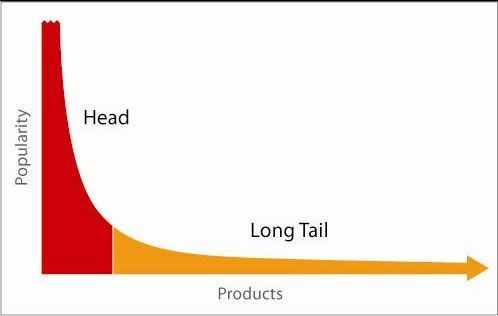 Chris Anderson's Blog The Long Tail continues his argument and provides updated examples of the long tail. As with any idea there are some criticisms which suggest that the long tail doesn't work. Long Tail isn't here yet - As the Wall Street Journal points out the long tail has yet to happen and most revenue comes from a smaller percentage of products. The head of the tail is becoming more concentrated and providing most of the profits. This statement is true, however Anderson says this is the 'percentage mistake'. As he replies, when you stock a much larger and wider range of products, the 'hits' will occupy a much smaller percentage. The impact of the long tail is much greater - As The Technological Liberation Front says, Anderson's argument understates the impact of the Long Tail on the industry and culture and in particular copyright. Not very scientific or economic - The concept makes sense although this is a valid criticism. Anderson is a journalist not an academic. His book and blog on 'The Long Tail' are filled more with anecdotes and case studies. A recently released paper titled 'A practical model for analyzing long tails' has actually created a economic model on this. Despite all of these criticisms, having an internet store is still cheaper than having a physical store! By reducing costs and relying only a warehouse and a website, companies are more able to provide more products for the same cost. Vodafone is already applying this concept of 'The Long Tail' with their online store providing a huge database of music and games. Many websites provide a free service on the internet with the ability to upgrade to premium services later on. For example, you can get a free Gmail address but you can purchase more storage space if necessary. Fred Wilson adopted the term 'freemium' to describe this sort of business model that many websites are adopting. In this case, the paying customers support the free customers. The low cost of the internet makes it much cheaper and easier to provide 'freemium' services than before. Chris Anderson at Nokia World 2007 gives a 45 minute lecture on 'free' on the internet and how it affects business. The article Free! Why $0.00 Is the Future of Business is the written form of this lecture. In the media world, 'free services' already exist. We have 'free' radio and 'free' TV, although these are really subsidised by advertisements. Anderson argues that internet is no different. Many of the so called 'free' services we use are actually subsidised by advertisers. Treating products as 'waste' brings innovation. Instead of worrying about what something costs, think instead of what we could do with something if it were too cheap to matter. This is one way to innovate and profit when new technology appears. Internet websites can follow the freemium model because the cost of providing the service is close to zero. Free changes everything. By providing something free, you can create value for something else. Again, Vodafone is already doing something similar with mobile phone handsets. Sell them cheap and the profit comes from the rate plans. We also have products like 'Best Mate', which gives unlimited calls to a favourite mobile. As a mobile phone company with online stores, Vodafone is already applying the concept of Web 2.0, long tail and freemium to its business operations. What Vodafone now needs to look at is how it can remain at the forefront of this. One mobile profile for website browsing and account management. How do we integrate the Long Tail and freemium into more products? How do we develop integrated Web 2.0 mobiles and desktops? How do we continue leading on the internet front? How can we 'waste' resources to innovate? What about the wider changes in society and the economy? One academic, Yochai Benkler calls the economy we are shifting to as the social production economy. In the following 18 minute lecture, Yochai Benkler sets out the conceptual frameworks for the social production economy we are entering. The lecture itself is based from the book he wrote Wealth of Networks. In keeping with the concept of controllable information, the written information in the book can be viewed in a variety of formats and layouts. The information economy already existed at the beginning of the century. Financial institutions, newspapers, televisions and books are all part of that information economy. Our rules, regulations and institutions are all based around the 'industrial mode' of production where only those who have capital can produce and distribute information. Consumer-based - Producers produce media, consumers consume media. This has changed with the internet. In the new networked economy, the cost and entry requirements of producing and distributing information has dropped dramatically to the point where anybody with a computer can now produce and create information. In other words, those who were consumers can now become producers much more easily. Because the rules and laws of regulation and business models are based around the industrial mode of information production, there is a clash between companies that have traditionally benefited from the old system and the companies that are trying to utilise the new system. Mode of information production (a computer) is in the hands of individuals. Social Rewards - Volunteer work. Peer recognition. Networking. Entertainment. User-based - Businesses produce and manage, users contribute and provide feedback. Android isn't necessarily better in terms of software and architecture at the moment, but Android is still seen as a threat. Why is this? If you apply the concepts of Wealth of Networks and Web 2.0 then we can see why Android threatens mobile companies like Vodafone. Android's major selling point is its customisation and personalisation. With Android, the barriers to creating your own application on a mobile phone have been drastically reduced and users can easily become contributors. All of the features covered above like being open source and open to collaboration are part of Web 2.0. You could assert that Google and the Openhandset Alliance are bringing the culture of Web 2.0 onto mobile phones. This action brings them in conflict with the more traditional minded mobile phone operators where users of the mobile phone are seen as consumers (not collaborators) and customisation is a premium. As 'Yochai Benkler' points out, the legal and political conflicts over the internet and software today will determine the future landscape of the information technology economy. Android is, I think a good case study in our line of business. Participative Web and User-Created Content: Web 2.0, Wikis and Social Networking - A detailed report by the OECD that looks at how the participative Web affects countries culturally, economically and technologically. OpenID - One centralised ID. Data Portability - So you can take your social networking data anywhere. More Virtual Worlds - 3D visualisation of the internet. Online Desktops - Integration between desktop and internet. Internet Zero - Where we wireup existing devices to become part of the network for better control. Closure of the digital divide - Increasing internet literacy, closing of the digital divide and more internet users. Social, cultural and economic change. Failure - Not all Web 2.0 websites will survive. What about Web 3.0? Here's a clip on Google's CEO Eric Schmidt talking about Web 3.0. Web 2.0 was a term designed to describe the various changes occurring on the internet. According to Tim O'Reilly, Web 2.0 is characterised by ideas such as treating the web as a platform, harnessing the collective intelligence of the internet and a rich user experience. As with any term, Web 2.0 is contested and others have included additional ideas of what Web 2.0 is such as data portability and moving beyond site-centredness. Examples of Web 2.0 websites include Ning and Newsvines and Microsoft World Wide Telescope. As the internet moves into Web 2.0, the economic concept of 'The Long Tail' and the freemium business model have been created to describe the business changes created by the internet. When it comes to wider societal changes, Yochai Benkler argues in his book 'Wealth of Networks' that the changes caused by the internet are fundamental and far-reaching, changing the very nature of our economy and culture. In the future we can expect trends such as data portability, increase in the number of internet users and online desktops. Here is a 4 and a half minute bonus video titled 'The Machine is Us/ing Us' showingcasing how information has changed with the internet.